A Beast of an album, a number of great children, and barely missing out on the top 20 of Maiden tunes is no defeat. Most other songs in the history of music would cut off a chorus to get there. It doesn’t say so in the official credits, but Bruce co-wrote this song with Steve. They never looked back, did they? From the darkness of the Maiden era most controversial, that in which Blaze replaced Bruce. Someone had to keep writing songs in the mid-1990s, and Steve delivered a milestone that still stands proud. In time Bruce returned to do his own version of it, but what could he have done if Blaze hadn’t been there to help craft the original? How would Maiden have made it through the 1980s without Adrian? Not that the 80s should have worried Maiden, but Adrian pushed the boundaries and set the bar higher, with songs and solos like this. He also wrote Wasted Years for the same record. Like it was easy! Who missed Adrian? Who missed Bruce? What a way to signal a comeback! 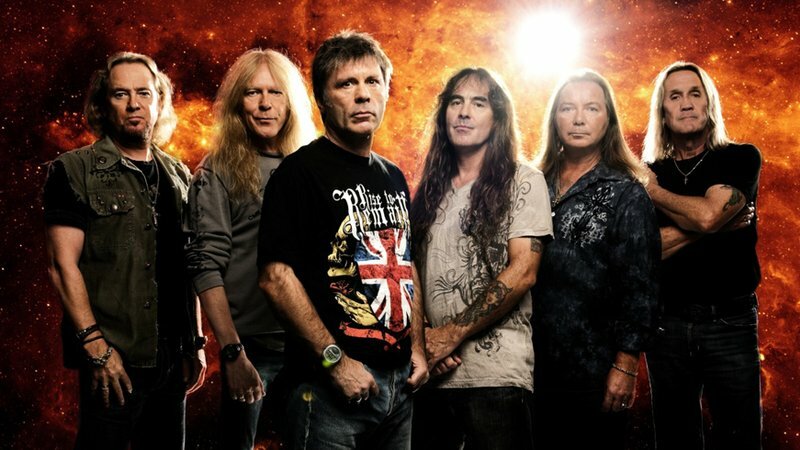 After a decade of Maiden music that even the most loyal fans would have to admit was controversial, Adrian returned for 2000 with an opening riff that bleeds effortlessly into a stadium-sized Maiden number, co-written with Bruce and Steve, and complete with a proper metal production by Kevin Shirley. There was much rejoicing! The longest jump, in the timeline! Bruce has come and gone and come again. A Matter Of Life And Death is an intense experience, a serious album, all of which the band performed live. They meant it, and we mean it when we put this track on the list. Here’s a representative of Maiden’s most cohesive post-2000 album, co-written by the unbeatable team of Adrian, Bruce and Steve. No one can take anything away from the late great Clive, whose awesome drumming is all over this track, but even Bruce knew the drums well enough to give Adrian the beat to start the riff that Steve turned into… and so on. Here’s a track that was always great, but which was so rarely heard until Maiden brought it back for their 2012-14 tour. Steve keeps cropping up here, having had more than a finger in the pie with most of what Maiden do. Again he writes the song, and what a song, and what a title track. And what a way to end Maiden’s glorious 1980s. …while this one is only slightly less so, having been performed on stage in 1983. Steve’s first overtly Eastern-sounding track, excepting one riff in the Genghis Khan instrumental, To Tame A Land showed the way and many EPIC songs would follow, way into the 2000s. Dance Of Death is not the greatest album Maiden has recorded, but some of their greatest songs can be found there, chief of which is this monumental (yes, EPIC) track by Adrian. It features spine-chilling lyrics from Steve about the ”kindermord” that happened in the World War I trenches, and a bravura orchestral production by the man who managed to lift Maiden’s sound into the 2000s, Kevin Shirley. Bruce could not be out-maneuvered in the realm of EPICS. His impressive songwriting for the band he joined just a couple of years earlier reached a climax with the title track to what many consider the ultimate Maiden album – Powerslave. Egypt, pyramids, pharaos, the afterlife. Mythical! Magical! Combine Maiden with Samuel Taylor Coleridge and you get the EPIC to end all EPICS. Bound together by a milestone production courtesy of the one and only Martin Birch, this Steve composition is what all other EPICS, Maiden’s or otherwise, will always be measured against. The King of EPICS. Steve himself has singled out this song, his own work, as the point where he felt he could see (or hear) where Maiden would be heading. Little wonder! Phantom sums up Maiden through the ages, in a way that very few bands can claim about a track on their debut album. Christer’s guilty pleasures: Can I Play With Madness (1988), Tailgunner (1990) and Brave New World (2000) could have made the list any day of the week! Torgrim’s guilty pleasures: Caught Somewhere In Time (1986), The Clansman (1998) and Dance Of Death (2003) don’t get enough love! Among those that just missed the cut (and which, on any given day, might find their way into the Top 20 the when I happen to listen to them) are Purgatory, The Nomad, No More Lies, Prowler, Hallowed Be They Name, Can I Play With Madness, and Children of the Damned. Addendum: it occurs to me that I, somehow, forgot 2 Minutes to Midnight, which is a baffling, egregious oversight. Especially since it slides in somewhere around #5. But narrowing down a list of the best Maiden songs to just 20 is almost impossible anyway. Calling somebody else’s choice impossible to understand (baffling) as well as conspicuously bad and offensive (egregious) is over the top, I think. Especially when you seem to agree that narrowing it down is almost impossible anyway. I was talking about my own choice. That list is uhmm uhmm, there’s too much reunion songs on it. hmm? here comes my list..
18. Be quick or be dead. Songs that could be into the list if it was made a month ago or in the next couple of weeks: Remember Tomorrow, Purgatory, The Number Of The Beast, Revelations, Alexander The Great, Fates Warning, Brave New World, Rainmaker, These Colours Don’t Run and For The Greater Good Of God. The Talisman certainly gets our vote as one of the most incredible Bruce performances in history! Coming Home made the list in part because of its message and ability to unite fans across the globe. Blood Brothers could be said to do the same. Surprised no one has ‘The Alchemist’ on their list. Best track on TFF in my opinion. This is my top 20 list (in particular way). 14 out of 20 songs are from the 80’s era. Seems to me this is Maidens most amazing era. The evil that men do is one of the best song they ever did it has the greatest guitar opening ever. I also love fortunes of war, i’d put that in top 5. Also mother russia would be there somewhere as would fates warning and of course blood brothers should be in a top 20 never liked To tame a land much, and where is Strange world one of the best rock ballads of all time. Hey guys I just met your website today while I was looking for a HD wallpaper for my ps4 and I am enjoying it.. Sorry for my English.. I am from Ecuador.. And here is my very hard worked top 20. I’m another guy who recently stumbled on this site and I’m really digging it. I’ll be honest and say that I’ve only been a casual Maiden fan since Fear of the Dark… as I just sorta figured the band was cooked once Bruce left. I eventually picked up used copies of the Blaze era CDs… I’m sure they are still tucked away in a box somewhere, but it’s been at least 15 years since I revisited them… Since Bruce came back, I’ve kept up on the releases, seen them live when they hit Detroit, but can’t say I listen to the newer albums nearly as much as I listened to their classic stuff during my youth… So my list will be heavy on the earlier stuff, take it for what it’s worth. I have received the occasional odd look from Maiden fans when I profess my love for “To Tame a Land”…. and while the lyrics are complete sci-fi goof…. damn that music is so good. I’d have to take my time and revisit the whole library, but I can’t imagine a better Harris epic from a musical perspective. My Top 20. I think I’m the first to put something on here from the new album? Which I think is SICK by the way. UP THE IRONS!!!! I think we all agree that Hallowed Be Thy Name is Maiden’s best song and that Infinite Dreams is a true masterpiece. Really like the Best/Worst lists! How about one for best closers? It is a very difficult choice , because Maiden have so many hits and my favorites ! But i think this 20 is the most beloved songs by my ! UP THE IRONS from Bulgaria !!! Im new on Iron Maiden, so i havent heard every Maiden song, so im gonna make my list (temporal) of songs i have heard. You could leave out all the songs in your top 20, start with different songs and you can still end up with a really good top 20 list, songs like bring your daughter, evil that man do, blood brothers, fear of the dark, number of beast , caught somewhere in time, wasted time and whole lot of other songs are as good as any in the list.